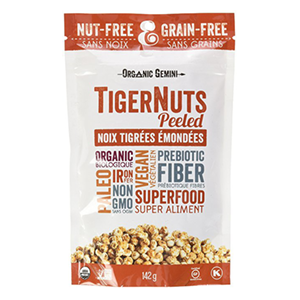 Tiger nuts, also called earth almonds or chufa, are a relatively new and trendy food recently introduced on a larger scale to worldwide health food enthusiasts in 2013. Claimed to be a wild foraged food source gathered by Paranthropus boisei or the "nutcracker man", the early ancestor of modern-day humans, they are frequently marketed as a "paleo" food. Evidence also suggests that they were a popular crop cultivated in ancient Egypt thousands of years ago. Although they are grown and have naturalized to moderate climates around the globe, the nuts are native to the Eastern hemisphere, mainly Africa, the Middle East, India, Madagascar and Mediterranean countries in Southern Europe. They are particularly well-known in Spain, especially in Valencia, as they are the original ingredient used to make horchata or "horchata de chufa", a blend of water, tigernuts and sweetener. 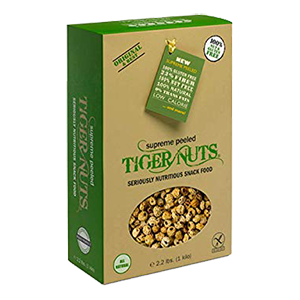 Tiger nuts come from the Cyperus esculentus plant species called yellow nutsedge. They are however not actually a nut, but a rather small odd-looking tuber that grows underground from a perennial grass-like herb. 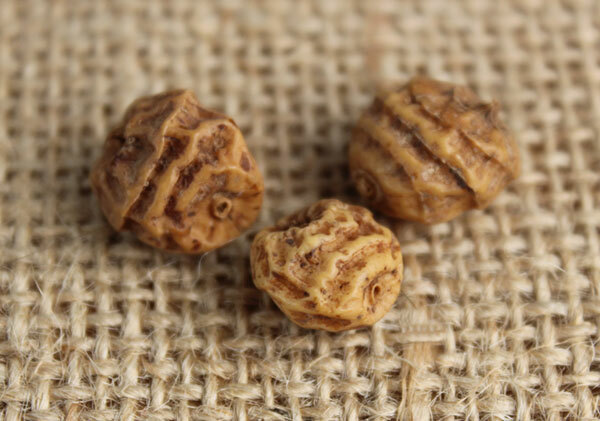 Today, tiger nuts are predominantly cultivated commercially in West Africa and Spain. Once harvested, they are washed, sun-dried and exported to other countries. What Do They Look and Taste Like? 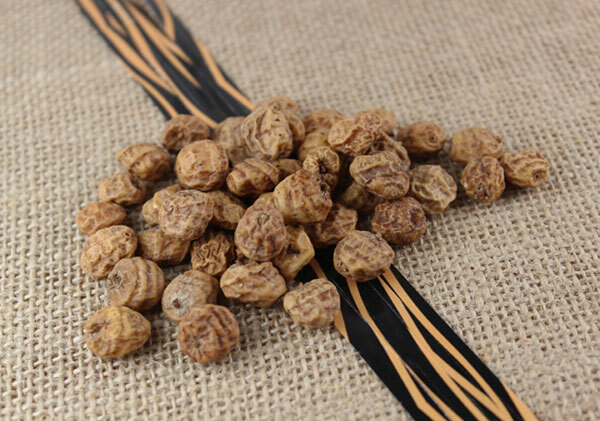 Tiger nuts, also spelled as one word: tigernuts, are often packaged and sold as a dried food. They have a size comparable to hazelnuts or chickpeas. With a somewhat wrinkled and unattractive looking appearance when dried, they can also have a ridged and sort of tiger-striped exterior, hence the name. Be warned, if you are looking for a crunchy nut-like snack, these might not be what you had in mind. Dried tigernuts eaten straight from the bag have a somewhat chewy texture. This is especially true for the unpeeled varieties which can also be more fibrous to gnaw on. If you're going to eat them straight by the handful, we recommended the peeled versions as they are slightly more appetizing as a snack food. The dried tubers have a pleasant semi-earthy nutty taste and are very sweet, kind of like cashews. In our opinion, however, their tasty flavor is much more palatable when soaked and thoroughly blended into drinks. 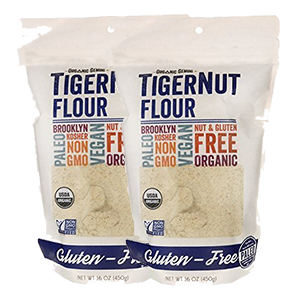 It is also possible to use pre-packaged tiger nut flour, which is frequently available from most suppliers. 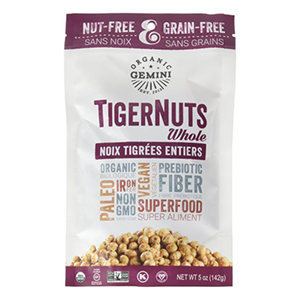 As a rhizome or tuber, tiger nuts are notably a perfect nut and seed replacement for those with allergic sensitives to peanuts and other high-allergen nut varieties. Likewise, they are also well-tolerated by those with certain autoimmune conditions, like celiac disease, as they are a gluten-free food. 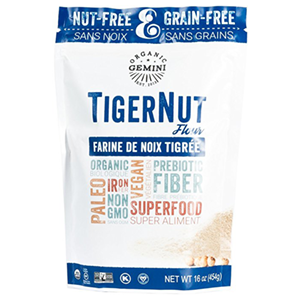 Tigernuts are commonly blended and strained to produce a type of plant-based dairy-free milk which offers an alternative for those on a raw vegan diet or individuals with lactose-intolerance. 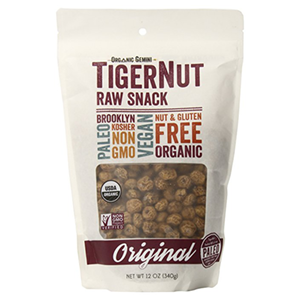 One of the often advertised benefits of tigernuts is that they are a natural source of "resistant starch." This means that after consumption they basically bypass digestion in the small intestine and are consumed, or technically "fermented", by microbiota in the large intestine. 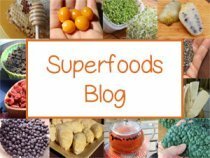 Resistant starch can have a mild laxative quality as it also acts as a source of dietary fiber. This particular element of the tigernut, much like that of flax and chia seeds, is also reported to be good for weight-loss because of its appetite satiating qualities. In other words, a blended tigernut shake can keep you full for longer periods of time compared to consuming the same calories from other foods. According to package labeling, whole unpeeled nuts have about 3 times as much fiber than the peeled varieties. A one-ounce portion size makes up about 40% of the recommended daily value (based on a 2,000 calorie diet). 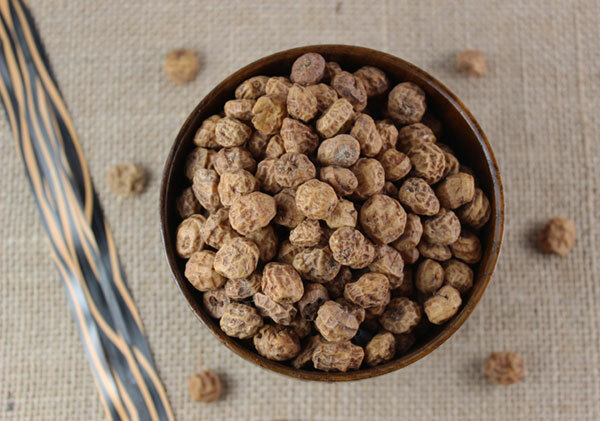 Tiger nuts are a relatively good source of the dietary minerals magnesium, iron, zinc, phosphorus and potassium as well as vitamins E, C and B-6. A one ounce serving is identified to contain about 11-12% fat content, including the saturated fats palmitic and stearic acid as well as unsaturated fatty acids, mainly oleic and linoleic acid. 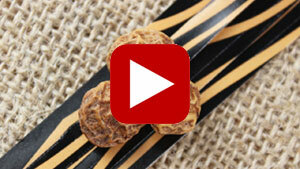 While tigernuts have some protein content they are not a high dietary source. For example: dried tiger "tubers" contain about 1g of protein per one-ounce serving whereas the same amount of brazil nuts have 4g, almonds have 6g and hemp seeds have 10.5g. 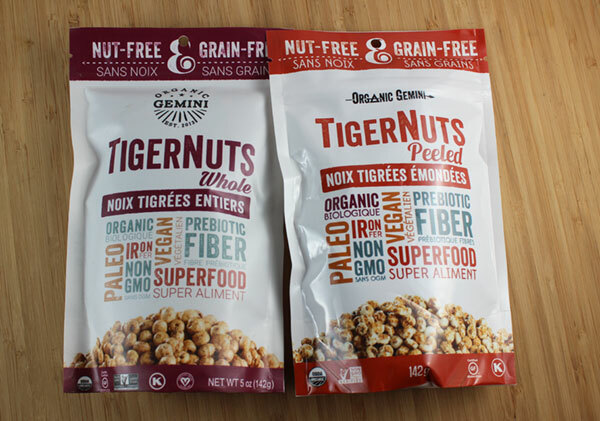 The top two brands currently in the U.S. are Organic Gemini and Tigernut USA. Na’Vi Organics is one of the main European companies, according to our research. 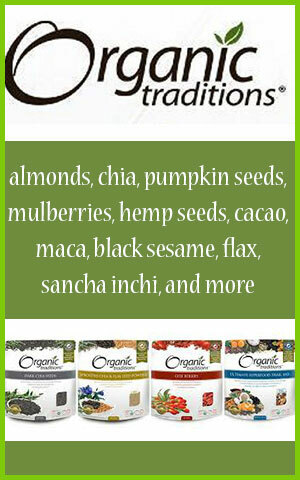 Organic Gemini - Their company began in 2013 and is based in Brooklyn, N.Y. 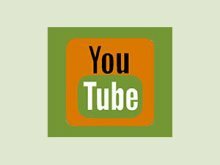 Watching some of their videos on the brand's production process, they seem to put an emphasis on providing a quality product. They are USDA Certified Organic and imported from Spain, but packaged in the U.S.
Tigernut USA - This is another manufacturer who imports the nuts into the U.S. from Spain. While they are similar to Organic Gemini's in quality, some of their products we noticed are not Certified Organic, so look for the USDA seal if this is a concern to you. As we mentioned, we prefer tigernuts after they are soaked and thoroughly blended as opposed to consuming them straight as a snack food which are somewhat hard to thoroughly chew. Tigernut milk can be made the same way you would prepare other nut milks and is an excellent replacement for dairy milk, soy or nut-based varieties. Just remember the nuts tend to take longer to soak than other types, usually about 24 hours from our experience. One of our favorite ways to prepare these dried tubers is as a raw kefir, similar to coconut kefir. Of course, the nuts are an excellent ingredient when making traditional Valencian-style horchata, a milky sweetened beverage served cold. 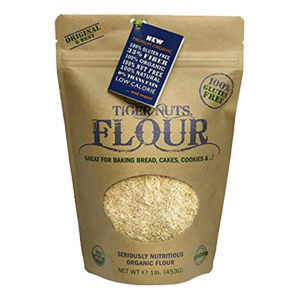 One of the easiest ways to use the nuts is as a flour which can be conveniently added to shakes, smoothies, breakfast cereals, vegan burgers, chia porridge, dessert recipes or when gluten-free baking. 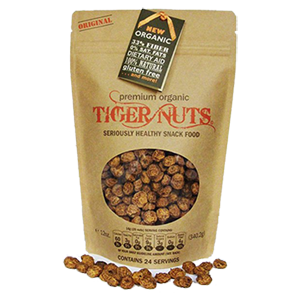 Tiger nuts when consumed in excess may cause bloating, loose stools and flatulence, especially when eaten as a dried variety. Consult your health care provider when making dietary changes when pregnant, nursing, or have serious medical conditions.